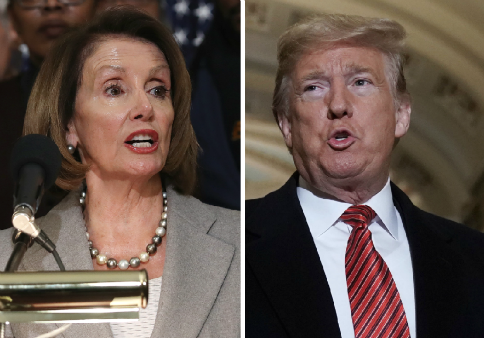 House Speaker Nancy Pelosi revealed for the first time Monday that she opposes the impeachment of President Donald Trump. "There have been increasing calls, including from some of your members, for impeachment of the president," noted Washington Post reporter Joe Heim. "I’m not for impeachment," the California Democrat responded. "This is news. I’m going to give you some news right now because I haven’t said this to any press person before." "Impeachment is so divisive to the country that unless there’s something so compelling and overwhelming and bipartisan, I don’t think we should go down that path, because it divides the country," she continued. "And he’s just not worth it." Pelosi insisted later in the interview that it is her view Trump is "ethically" and "intellectually" unfit to be president, but she doesn't believe that ought to be her focus. "I don’t usually talk about him this much. This is the most I’ve probably talked about him. I hardly ever talk about him," she said. "You know, it’s not about him. It’s about what we can do for the people to lower health-care costs, bigger paychecks, cleaner government." Pelosi was previously critical of calls for impeachment without overtly opposing the idea, saying billionaire Tom Steyer's media blitz during the 2018 midterm elections was "a gift to the Republicans." Pelosi was also among the top Democrats who were critical in January of Rep. Rashida Tlaib's call to "impeach the motherf***er." "That is not the position of the House Democratic Caucus…" she said at an MSNBC town hall. "I do think that we want to be unified and bring people together. Impeachment is a very divisive approach to take and we shouldn’t take it … without the facts." This entry was posted in Politics and tagged Donald Trump, Nancy Pelosi. Bookmark the permalink.